1. LED Indicator: If the led could not show successfully, please try to discharge the power bank completely first, then recharge the power bank again, normally the led problem will be solved .If problem remains, please contact us for exchanging a free one. 2. Recharging: DC 5V/2A or 5V/2.4A charger as well as the original usb cable are recommended to recharge the battery pack which takes about 10-12 hours. Not one, not two, but three iSmart 2.0 USB ports to power up to 3 devices at once. 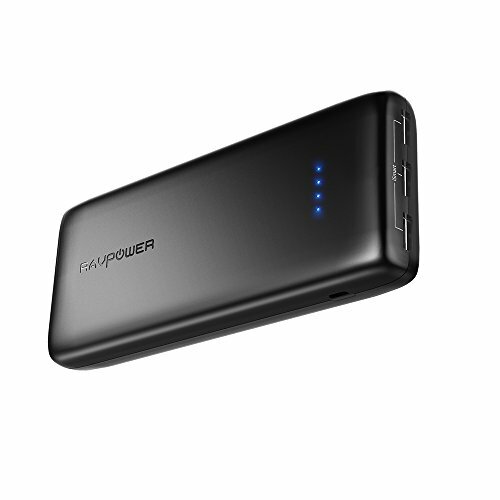 Whether you use it for yourself or you share it with your friends, its huge 22000mAh capacity will take care of any power need you throw at it: fully charge an iPhone X up to 4.9 times, iPhone 8 7.2 times,a Galaxy S8 4.4 times, S7 up to 5 times, or an iPad Mini more than 2 times. When the power bank is finally empty, charge it back up in just 10-11 hours with a 5V / 2A or 2.4A ac adapter. The new and improved portable charger with high-density Li-polymer battery outlasts both conventional Li-polymer batteries and 18650 cells when it comes to efficiency, performance, and protection. 1.If all the 4 LED start to blink,It is because the Self - Protection mode has been turned on both USB input and output are disabled. To restore functionality, disconnect all connections and wait 10 seconds, then charge the product. 2. Compatible with the new 12 inch MacBook 2015 (USB-C to USB 2.0 cable needed) & tablets (including the Nexus 7).